A fictitious town near the Oscura Mountains in Socorro County in central New Mexico. A small community mentioned in Tony Hillerman's 1970 Navajo detective novel THE BLESSING WAY, Hall is a town close to the home of the novel's antagonist Jim W. Hall. The Oscura Mountains happen to be at the north end of White Sands Missile Range and are also the site of an Air Force Research Laboratory, an interesting tie-in to the novel's plot. 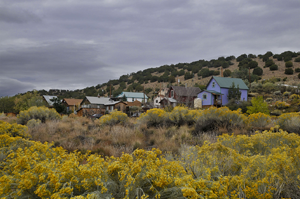 "Small town in central New Mexico, October 5, 2008" by Mike Fisher is licensed under CC BY.